Over the three years of this project 8 ASP will provide training to 75 RI farmers on construction and use of caterpillar tunnels. These farmers will mostly be small acreage farmers, probably farming a total of 200 acres in Rhode Island. Most vegetable farms in Rhode Island are very small, often an acre or less. One method to increase production on small acreage is to extend the growing season with tunnels or greenhouses. 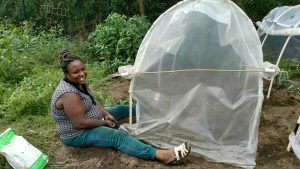 Many small growers can not afford nor have the space for high tunnels or greenhouses. Rhode Island’s SARE project is to introduce small growers and their Ag Service Providers to caterpillar tunnels, also known as field tunnels. ASP and growers will learn how to build caterpillar tunnels and how to grow crops using caterpillar tunnels. URI Cooperative Extension personnel, Heather Faubert and Andy Radin, will conduct one on-farm training per year for ASP and farmers where participants will learn about the benefits of caterpillar tunnels and how to construct them. A second meeting each year will focus on crop production techniques for growing crops in caterpillar tunnels outlined in the Learning Outcomes. Trainings will be held on RI working farms. Farmers will be recruited from a pool suggested by RI ASP and contacted by Heather Faubert to determine interest and feasibility of farm hosting a workshop. Final selection of farmer will be made by Heather Faubert. Rhode Island is considered to be divided into three areas: Northern, Southern, and Eastern and demonstration farms will be in a different area of the state each year. ASP will be invited to visit farms where caterpillar tunnels have been constructed and are being used with Andy Radin and/or Heather Faubert. Four ASP will individually accompany Heather or Andy and see firsthand the benefits of growing inside caterpillar tunnels. By seeing the caterpillar tunnels in use by growers and learning about growers’ experiences using the tunnels, the ASPs will be better able to advise other RI growers about constructing and using them. ASPs will also receive a project-developed factsheet on how to build caterpillar tunnels, including the cost of materials needed for construction and where materials can be purchased, and how to manage crop production in the tunnels. 1. 25 Agriculture Service Providers (APS) and 400 farmers receive advertisements for workshop on caterpillar tunnel construction and use. Workshop will be at a small vegetable farm in Rhode Island. (Spring 2018). Meeting was advertised to growers and ASP through Southside Community Landtrust (SCLT). It was not the original intention to limit this workshop to the SCLT community, but we are developing an excellent relationship with Southside ASPs and growers and want to continue working closely with them. Most of the farmers are recent African immigrants and speak very little English. Mixing the immigrant farming community with the general farming community was discouraged. 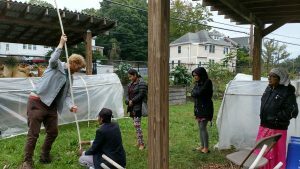 SCLT started in 1981 and now owns or directly manages 21 community gardens in Providence, Pawtucket and Central Falls, and partners with schools, housing and community organizations to manage another 37 community gardens. SCLT owns or manages land used by 25 farmers to supply fresh fruits and vegetables to farmers markets, food businesses, restaurants, and CSAs. 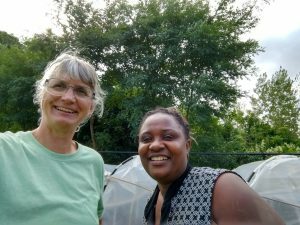 They also operate three farms in Providence and Pawtucket where they practice and demonstrate bio-intensive, small-scale agricultural production. 2. 6 Agricultural Service Providers and 20 farmers attend workshop to learn about caterpillar tunnel construction and how they can be used with a variety of crops. Thirty foot long caterpillar tunnel will actually be constructed at the workshop. Techniques for covering with different materials and venting will also be discussed and demonstrated. (Spring/Summer 2018). We constructed 6 caterpillar tunnels at Manton Bend Community Farm in Providence with 5 ASP from Southside Community Landtrust. Eight growers attended the workshop. Most of the growers manage plots at Manton Bend Community Farm. It was a very successful workshop and growers want to build more tunnels in the spring! 3. 25 Agriculture Service Providers (APS) and 400 farmers receive advertisements for workshop on growing crops in caterpillar tunnels. Workshop will be at a small vegetable farm in Rhode Island. (Summer 2018). 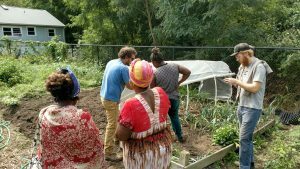 Meeting was advertised to Southside Community Land Trust growers and organization. Transportation was provided for them to travel from Providence to URI in Kingston, RI on April 7th. 4. 6 Agricultural Service Providers and 20 farmers attend workshop to learn how to grow various field crops in caterpillar tunnels. (Summer 2018). ASP and growers from Southside Community Landscape came to URI Agronomy Farm and learned about early season crops that can grow in caterpillar tunnels on April 7th. All were impressed with early production despite very cold conditions and storms in March and early April. Another meeting on constructing and using caterpillar tunnels is being planned for Summer 2018. 5. 2 ASP visit farm where workshop was held with Heather Faubert and/or Andy Radin and the host farmer. ASPs will witness growing conditions and learn about farmer's experiences and opinions on growing crops under caterpillar tunnel. Comparisons will be made to field grown crops. (Summer 2018). Project leaders met with growers and ASPs at 3 different farms on 3 different evenings (June 11, July 9 and August 6). Field tunnels had not been constructed yet so the focus of these meetings was insect and disease identification. We discussed using field tunnels to decrease disease pressure and exclude some insect pests. 6. 26 attendees of the workshop receive and respond to a follow-up evaluation. The project leader conducted in-person interviews about the value of the project with ASPs from Southside Community Landtrust and URI. The ASPs were thrilled with the training and two ASPs hosted their own workshop on constructing caterpillar tunnels on October 1st. I assisted with their meeting which the ASPs really appreciated. The other ASP has received requests on attending a tunnel construction workshop in 2019. It was more difficult to survey the growers since their English is limited. Probably a better indication is the smiles on their faces and them wanting to build more caterpillar tunnels and to find more land to grow on. •	The project team begins writing factsheet on construction and cost of building caterpillar tunnels, and techniques for their use throughout the growing season. Information learned via the workshop and farm visits with ASPs will inform the factsheet. (Fall 2018). This milestone is not complete yet. Agricultural Service Providers and farmers attend workshop to learn about caterpillar tunnel construction and use. Thirty foot long caterpillar tunnel will actually be constructed at the workshop. Techniques for covering with different materials and venting will also be discussed and demonstrated. Agricultural Service Providers and farmers attend workshop to learn how to grow various field crops in caterpillar tunnels. ASP visit farm where workshop was held in Year 1 or Year 2 with Heather Faubert and/or Andy Radin and farmer. ASPs will witness growing conditions and learn about farmers' experiences growing crops under caterpillar tunnel. Comparisons will be made to field grown crops. 1. 25 Agriculture Service Providers (APS)and 400 farmers receive advertisements for workshop on caterpillar tunnel construction and use. Workshop will be at a small vegetable farm in a different part of Rhode Island. (Spring 2019). 2. 6 Agricultural Service Providers and 20 farmers attend workshop to learn about caterpillar tunnel construction and use. Thirty foot long caterpillar tunnel will actually be constructed at the workshop. Techniques for covering with different materials and venting will also be discussed and demonstrated. (Spring/Summer 2019). 3. 25 Agriculture Service Providers (APS) and 400 farmers receive advertisements for workshop on growing crops in caterpillar tunnels. Workshop will be at a small vegetable farm in Rhode Island. (Summer 2019). 4. 6 Agricultural Service Providers and 20 farmers attend workshop to learn how to grow various field crops in caterpillar tunnels. (Summer 2019). 5. 3 ASP visit farm where workshop was held in Year 1 or Year 2 with Heather Faubert and/or Andy Radin and farmer. ASPs will witness growing conditions and learn about farmers' experiences growing crops under caterpillar tunnel. Comparisons will be made to field grown crops. (Summer 2019). 7. 25 ASPs and 400 Farmers receive the completed factsheet on caterpillar tunnels via email. Copies will also be printed and distributed at future Extension and SARE project meetings. (Fall 2019). 1 Agricultural service providers reported changes in knowledge, skills and/or attitudes as a result of their participation. ASP from Southside Community Landtrust held his own field tunnel construction workshop after attending the RI SARE workshop. I assisted with this workshop and one Nepalese grower intended to build a tunnel on some of his land. Growers at both workshops learned about what crops grow best in caterpillar tunnels, especially late into the fall and early spring. One grower planted scallions and leeks in her tunnel constructed in September. Growers also learned about rolling up the sides of the tunnels when the weather was greater than 50 degrees and sunny. Through in-person interviews I learned that one trained ASP conducted his own caterpillar building workshop after attending the RI SARE workshop. I assisted with this workshop and one Nepalese grower intended to build a tunnel on some of his land. The ASP also talked to several growers (at least 5) wanting assistance in building caterpillar tunnels in 2019. I talked to two other ASP present at the URI SARE trainings and they do not intend to hold their own tunnel building or use workshops. Construct caterpillar tunnel and extend growing season with crops produced under tunnels. Caterpillar tunnels were constructed on 5 growers’ plots, though only one started actually growing in tunnels in 2018. Three other growers have tunnels ready to go for 2019 growing. This information was obtained by helping 4 growers construct tunnels on their plots. The fifth grower told me he is going to construct at least one tunnel. I am extremely pleased with the outcome of Rhode Island’s first year of this project. We have made strong and stable relationships with Southside Community Landtrust and immigrant farmers they work with. We look forward to continuing this work in 2019 and 2020. September 21, 2018 workshop on caterpillar tunnel construction. Sept 21, nearly completed tunnel. Oct 1, 2018 workshop put on by ASP. I provided SARE outreach material at RI Fruit Grower Association meetings and the RI Raised Livestock Association Annual Meeting. I also talked individually to many growers about applying for SARE grower grants and two farmers I talked to submitted farmer grant applications for 2019.